Excerpted from Vogue France. Written by Sophie Volanges. Photos by Mario Sorrenti. 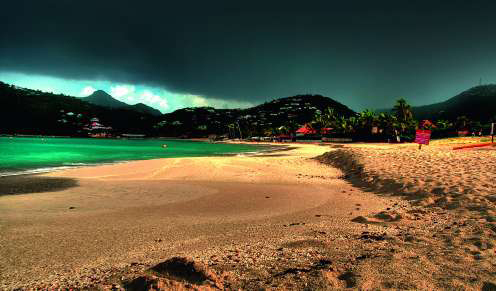 St Barth quietly maintains its VIP reputation from one New Year’s Eve to the following. A well deserved reputation, where serenity and a protected environment shape a discreet and fashionable "art de vivre". The island hopper plane seems to be lost in all of the shades of blues surrounding it, from the azure skies to the turquoise seas all you can see are blues, to the left or to the right, beneath or above you, with only a few fluffy white clouds lazily floating by. From St Martin, the trip lasts less than 10 minutes and yet you can cross path with the rich and famous of the world: Beyonce, Demi Moore or Gwen Stefani have all traveled it. 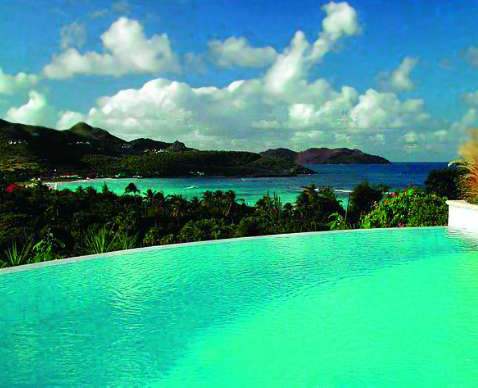 Less than ten minutes and then St Barth appears; emerald green, with pristine beaches and dotted with red roofs. Others prefer to arrive by the way of the sea, as did Christopher Columbus in 1492. And if old fashioned schooners are sometimes seen in the harbour, it is now in mega yachts that business tycoons choose to arrive on this enchanted island. At the end of the 1950’s, David Rockefeller is the first to be mesmerized by this brilliant spec of an island in the French Antilles. He will bring with him the jet setters of his era. Thirty years later, Patrick Demarchelier transformed the island onto his personal open-air studio; the likes of Linda Evangelista, Claudia Schiffer and Christy Turlington are often seen on one of the 14 picture perfect beaches enjoying the year round 80 degrees weather. Today, nothing seems to have changed… Roman Abramovitch bought the estate of an American billionaire (his New Years Party there for 250 guests, with private concert by Prince will not be forgetten any time soon) and Kate Moss is still among the faithful. But it is rare that the billionaires, top models and other showbiz stars in search of serenity go to one of the few hotels of the island. They will not settle for anything other than a private villa, away from the hubbub, to lounge by a cobalt pool or on a shaded terrace with a breathtaking view. These gems would be hard to find in any other place than on this enchanting island. Away from the harbour of Gustavia, where the boats gently bob and sway in front of the windows of Chopard or Bulgari, these confidential addresses are hidden away in the 21 square kilometers of the island. To find them, there are a few solutions. Word of mouth is an option, but the surest bet is to contact Wimco Villas, one of the island’s rental agencies. In one phone call, Wimco will organize it all, from flights to your arrival and transfers. Feet in the sand or perched high on a mountain, the choice is yours. Lovers can cloister themselves mountain-side hideaways, in a nest of rough stones, precious woods and cream walls, surrounded by a tropical garden of palm trees and other exotic plants. Larger families – or groups of friends – may choose to stay at a villa on Lorient beach: five bedroom, five bathrooms, lap pool and on the horizon the silhouettes of Anguilla and St Martin. With another phone call, Wimco will reserve for your pleasure a private chef or a table in one of the fabulous restaurants, a yacht for a nautical picnic or a private snorkeling adventure. A custom fit service to enjoy the best of what St Barth has to offer, namely: a protected environment, peaceful serenity, talcum fine white sandy beaches or a shopping spree at the Carré d’Or – The rare pleasure of perfect freedom.